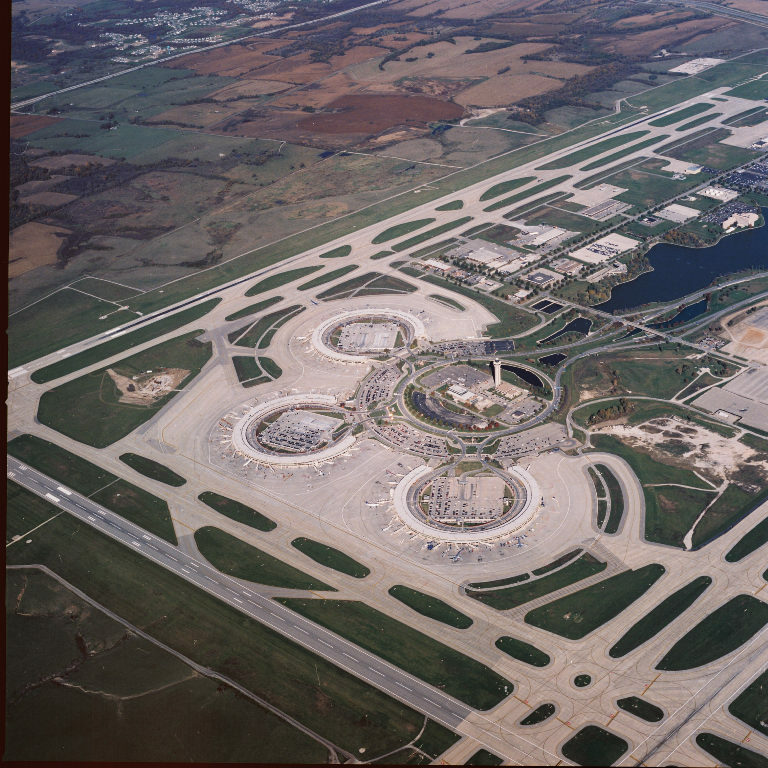 Kansas City International Airport (MCI) is one of the weirdest, if not the weirdest international airport in the United States. I’ve been to many of them, and I’ve never seen anything like this, especially not in a city of this size. Traveling there? Then you MUST read this…. As you can see, it’s 3 semi-circles, those are the 3 terminals, A, B, and C. Only B and C are used for commercial travel. I’m not sure what A is for. I flew in and out of terminal C with US Airways. Here’s where it gets confusing. These circles are split in half, lengthwise, with a large wall that acts to separate the gates from the rest of the airport. This means that airport security covers only a handful of gates at a time and opens about an hour before your flight leaves. Since each TSA line only covers a handful of gates, it means that you’ll probably have to leave security if you’re going to connect at Kansas City International Airport. Fortunately, it doesn’t seem to be a hub for any major airlines, so you probably won’t be connecting there. Ticketing, gates, baggage claim are all next to each other. Right across from all the gates, separated by this wall. You stand at baggage claim and literally see people arriving from their flights. Weird. Because of this design it gets REALLY crowded. Imaging people checking into their flights, claiming their bags, trying to find rental cars, waiting in line for security, and trying to find a place to sit, all right next to each other. It can get crazy. There’s almost nowhere to sit, the WiFi is slow and kept kicking me off, and electrical outlets are difficult to find. I didn’t walk the entirety of the circle, so I can only speak to the US Airways section. There’s an extremely limited number of stores in the airport and a limited selection of places to eat before security. At least there’s a Starbucks for you to enjoy before security. I ate at the KC Brew Pub. I ordered the smoked pork sandwich. Normally, I would probably think it was good, but since I had such great BBQ over the weekend, I wasn’t impressed. As far as rental cars are concerned. I used Enterprise, and the guys working there were AWESOME. They somehow knew my name picking up the car and returning it, and were friendly. 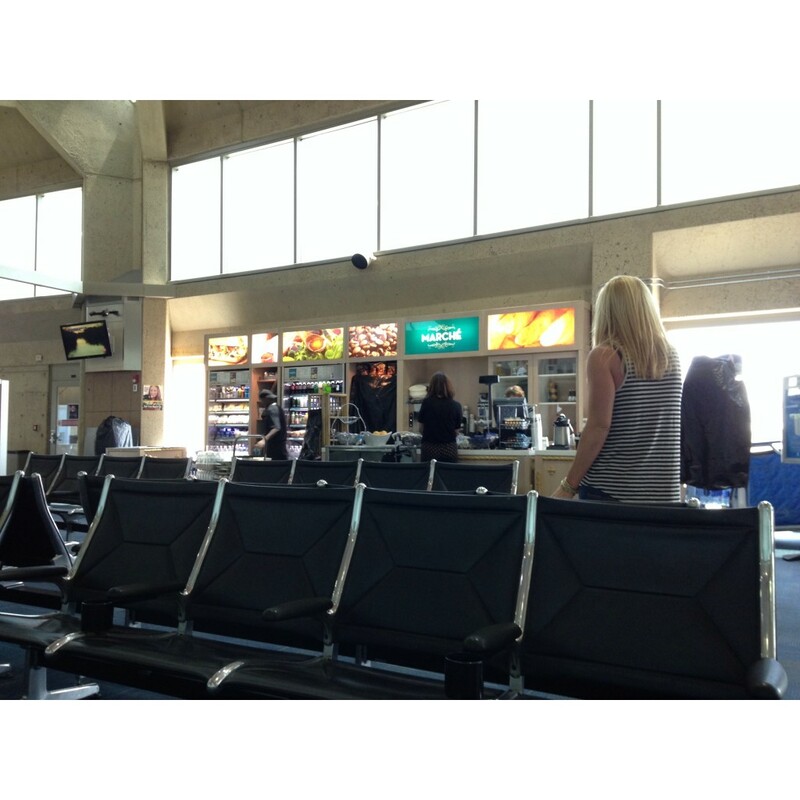 Kansas City International Airport has a separate rental car facility for all of its companies. You get there by taking a shuttle that you catch at the median right outside of the airport. Just walk outside and you’ll see signs that say “Rental Car Shuttle.” That will take you to a huge facility where there are plenty of companies to choose from. Returning the car is a straight forward process and the center is easy to get to. There are also numerous gas stations around the airport, so don’t feel the need to get ripped off prepaying for gas! Are you an Admiral’s Club or US Airways Lounge member? It doesn’t matter, there are no lounges or clubs for you to relax at. This time, you’ll suffer like the rest of us. What I’m about to tell you now is the only thing that you’ll really need to know. There is only ONE food option after security. Here it is. Beware, eat before security or face the consequences of old coffee, ultra expensive water, and cold sandwiches at the only food option after security. If I’m going to eat an an airport, I usually wait until after security, so I’m not pressed for time. In this case, I asked an employee to recommend a place to eat and he warned me about the only option after security. So no, I didn’t try it. Feel free to thank me for the warning! There are a few things I look for in airports. Accessibility to corresponding city. Ease of transport within the airport. Comfort (seating/plugs/shopping). Food. And the wildcard. The wildcard is something unique that helps or hurts the airport. The Kansas City International Airport receives a 4 out of 10. The weird layout and lack of food options after security was just too much to bear!